Our bright neighboring star system, Alpha Centauri, could harbor an Earth-size planet — but new jumps in technology are needed for us to see it. 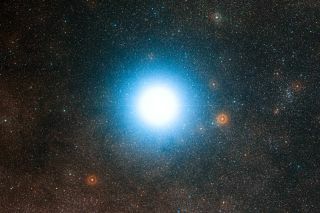 Technology in development could capture images from an Earth-size planet in the nearby Alpha Centauri system in the 2020s, new research suggests. The new technique, presented Dec. 15 at the American Geophysical Union's annual meeting in New Orleans, could also help researchers see exoplanets in other systems with more than one star. Although there's only one star in Earth's solar system, previous work found that two-thirds of so-called class G yellow dwarf stars (the group that includes our sun) are in multiple systems, or systems with two or more stars orbiting each other. Some known multiple systems are home to up to seven stars. [What Do We Know About Alpha Centauri?] Because multiple systems are common, they may be rich targets in the hunt for alien planets, according to Ruslan Belikov, an astrophysicist at NASA's Ames Research Center in Moffett Field, California, and his colleagues. For example, the sun's closest neighbor, the Alpha Centauri system, possesses three stars and potentially multiple planets, such as the Earth-size Proxima Centauri b. To capture images of an exoplanet, astronomers typically employ an instrument known as a coronagraph, which blocks out its star's glaring light, thus letting them seeany faint light reflected off or emitted from that world. When researchers want to directly image an exoplanet in a system that has more than one star, light from a star's companion may drown out their view of the planet even after they block the first star's light. Although scientists could conceivably use more than one coronagraph to block out the light from all the stars in a multiple system, tiny imperfections within the components of a telescope would inevitably cause light to leak through a coronagraph, Belikov said. "This light is only a small fraction of the original star's light but can still overwhelm planets, which are much fainter still," he told Space.com.Belikov and his colleagues have developed a way to get around that issue and image exoplanets in multiple-star systems. "We are developing the technology to search for Earth-like planets around other stars," Belikov said in an email. "If, when I was a kid, somebody told me that I would be doing this as an adult, I would not have believed it — in my mind, detecting Earth-like planets is 'Star Trek' science that rightly belongs in the 23rd century. But we are doing it now." The new method the researchers have devised, known as the multi-star wavefront control, relies on deformable mirrors within telescopes that are used to bounce light from stars and planets onto sensors. These mirrors can alter the shape of their surfaces to correct for imperfections within the optical components of telescopes. The new technique controls a deformable mirror "in a way that allows it to remove light from more than one star," Belikov said. The mirror can superimpose multiple shapes onto itself, each of which can factor out light from a star. "It's a bit like when an audio speaker plays a symphony," Belikov said. "It uses its lower-frequency range to represent the cellos and the higher-frequency range to represent the violins. In our case, the cello would correspond to one star and the violin to the other." A major advantage of this new system "is that it is compatible with many already-designed instruments," Belikov said. "A deformable mirror is all that's needed, which is almost always present with modern coronagraphs." Ideally, "we hope to infuse our technology into future space telescopes to enable them to target Alpha Centauri and other binaries," Belikov said. "These range from small telescopes like ACESat or Project Blue that can be launched in the early 2020s, WFIRST in the mid-2020s, and LUVOIR or HabEx in the 2030s. There are also telescopes on the ground that can use this technology." Belikov cautioned that any exoplanet pictures that researchers capture in the near future will not resolve details such as continents and oceans. "Rather, an image of another Earth will be a pale blue dot," he said. "However, there is a lot of information that we can discern from the spectrum of that dot, including signs of life."